You are welcome to pick up your puppy in person, of course, but sometimes busy schedules or long distances make it tough. If this is the case for you, check out the options below. Please note that Lancaster Puppies itself does not ship puppies. And due to USDA regulations, not all breeders can ship puppies either. Ask your breeder, and they may prefer making shipping arrangements themselves. However, if they don't have a shipping process, we can give you information on people who can. 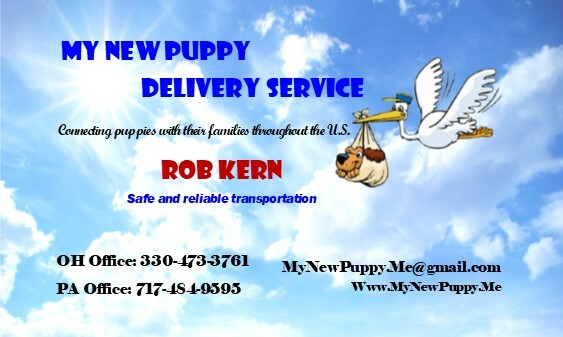 Give them a call for details and depend on safe and reliable travel for your new pup! Runway Pets offers discount airfare tickets for your pup's trip. Airline ticket rates do not include a travel crate (which is not optional) nor does it cover the transportation costs of taking the puppy to the airport, or the required Health Certificate that is needed. These are details you must work out with the breeder. An airline approved travel crate is typically around $50, (which you get to keep) USDA Health certificate ranges from $50 on up, and travel fees to the airport vary.